Meet the mashed potatoes of your dreams. 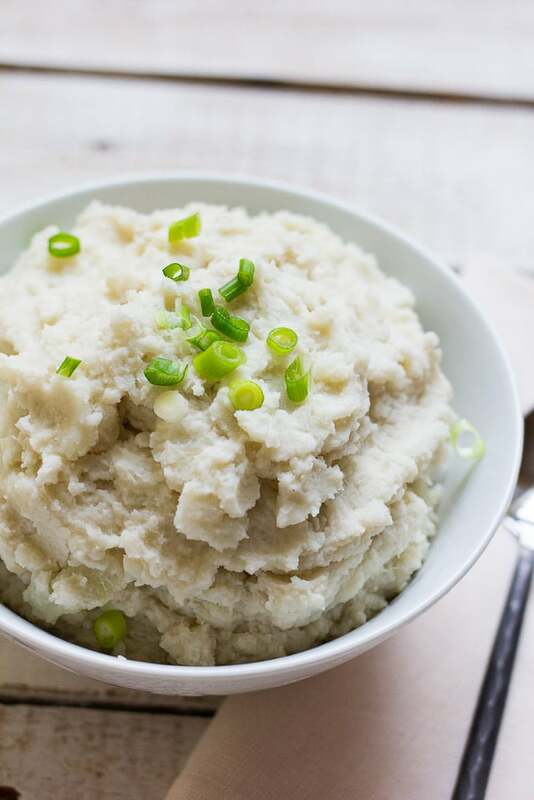 These dairy free mashed potatoes are SO creamy without any butter, cream or oil. 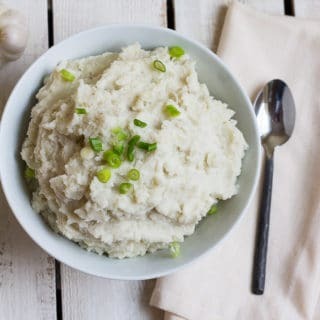 Infused with a roasted garlic cashew cream sauce, these mashed potatoes will be a hit come the holidays! This recipe is simple (5 ingredients including salt & water) and quite easy to make. You start by soaking the raw cashews in hot water for at least 5 minutes and up to an hour if you don’t have a high-powered blender like a Vitamix. Next, roast a whole head of garlic. You won’t use ALL of it (unless you really love garlic!). Just throw it in the oven for about 30 minutes at 400 degrees. To make the roasted garlic cashew cream, add the cashews, 3/4 cup fresh water and garlic to a blender and blend until creamy and smooth. You can totally use a food processor or blender for this, just make sure to soak the cashews for an hour or close to it. Boil your potatoes. Drain. Add cashew cream and mash with a potato masher. Add salt to taste. Done! Dairy Free Creamy Mashed Potatoes will be a hit at your Thanksgiving table, and no one will miss the dairy usually involved. Serve with this Vegan Meatloaf and some Easy Vegan Gravy for a plant-based feast! 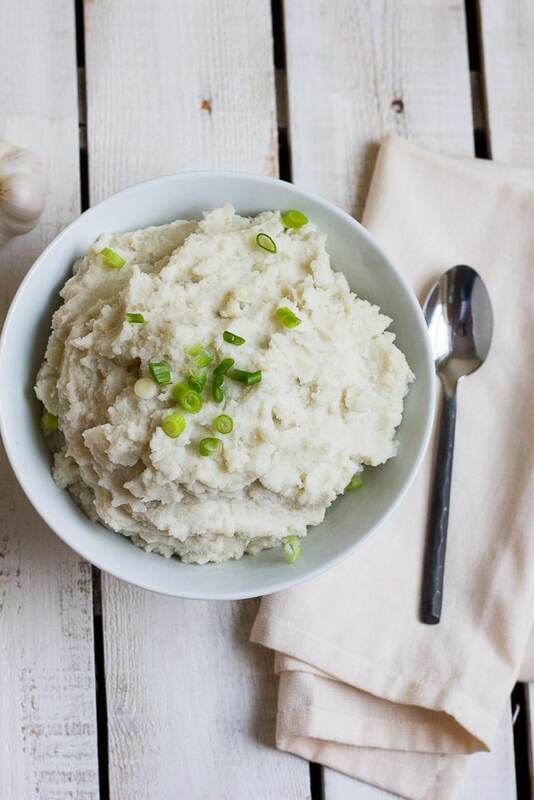 The CREAMIEST dairy free mashed potatoes on the planet, infused with roasted garlic. Your guests won't believe there's no butter or cream involved! Roast the garlic by placing the entire head on a roasting pan. Roast at 400 degrees for about 25-30 minutes. Remove from the oven and let cool. Peel (or leave skin on, if desired) the potatoes and chop into 1/2 inch pieces. Add the potatoes to a large pot and cover with water. Bring to a boil and cook for about 15 minutes, until the potatoes are fork tender. Drain and potatoes, and then return them back to the pot. While the potatoes are boiling, make the garlic cashew cream. Drain the soaked cashews and add the 3/4 cup water to a high powered blender (or regular blender, or food processor). Also squeeze out 5-6 cloves of the roasted garlic into the blender. Blend a few minutes until very smooth and creamy. Start mashing the potatoes with a hand masher. Add in cashew cream and continue to mash until fairly smooth and creamy. Add salt to taste. Sprinkle with chives if desired and serve. -If you are trying to use minimal fat in your diet, you could use 1/2 the amount of cashew cream, or as little as possible to make them creamy.